God’s grace is sufficient Gym day 6 again! If you didn’t catch that, I didn’t make it to the gym yesterday. Yes, I was all ready to go and then I got a flat tire in our wonderful Indiana snow. Due to my brilliant driving skills in inclement weather I ran into a curb, but thankfully, the air slowly released from the tire and it didn’t completely go flat until I got off of the highway. So after waiting almost 3 hours for AAA who they were too busy to show up, my wonderful stepfather and brother had my tire changed and had me back on the road, but far too late to go to the gym. But, I definitely made it today. And it felt good. Me and the kiddo got our cardio and strength training end. Then I went home and made another delicious smoothie. I tasted it first without the banana and it was very bland, so since I love banana I threw it end and it was delish! You really can throw any fruit or vegetable in a blender and mix it with healthy stuff like oatmeal or whey powder, or I’ve heard people use chia seeds, but I haven’t tried that yet. It’s on my list to try and I’ll let you know. 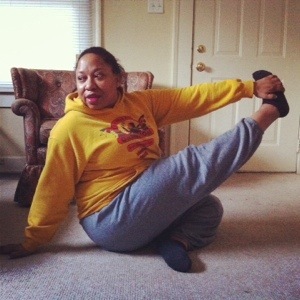 I’m also doing this #30DYC (yoga challenge) on Instagram. You can find me @ValleyDlights. 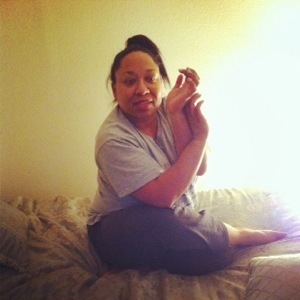 It’s just each day a group of yogis post one pose a day and you copy that pose and snap a pic and post it. It’s pretty cool, because I really wanted to take some yoga classes, so I’ll see how this challenge works out. So, goodnight, I’m exhausted, you know, end of the week, and all that.